The Importance of Listening: As announced here earlier this week, there was a special Shabbos afternoon study session at Congregation Albert yesterday, presented through the efforts of Dr Gordon Bronitsky and members of CA's Navajo-Jewish Dialogue. Abq Jew (and about 50 others) was privileged to attend this Dialogue, which Dr Bronitsky says he has wanted to create since 1987. We must point out that Dr Bronitsky - who has been "providing quality cultural experiences that inspire, educate and entertain audiences and participants around the world" for almost 20 years - is no stranger to dialogue. Nor is Rabbi Rosenfeld (or his wife, Michele Hope), who particularly fostered dialogue during their stint with the Frozen Chosen in Anchorage. Mr Dennison and his colleague, Frank Morgan - a translator and primary authority on Navajo language - also did not disappoint. In fact, Abq Jew found that everyone involved in this Dialogue - especially including the audience - listened with respect, spoke with humility, and was actively engaged. One of Abq Jew's "take-aways" from this Dialogue - aside from the need for more! - was the importance of language to both the Jewish and the Navajo communities. Rabbi Rosenfeld was asked about this directly: Aren't Jews allowed to pray in the vernacular? His response (as Abq Jew recalls): Yes, but ... we lose something when we eliminate the Hebrew, even if we do not understand the words. Sometimes the sounds of the words are even more important than their meanings. Mr Dennison (and Mr Morgan) also conveyed the transcendent nature of the Navajo language, which, they fear, is being drowned out by the dominant culture. Abq Jew remembers that there was, at one time, a movement in Jewish education that claimed that the Hebrew language was "all" that needed to be taught to Jewish children - that if Hebrew was taught, all of Jewish civilization would be transmitted along with it. We're not sure where this movement went - Abq Jew has lost touch - but the point is well taken, and certainly applies to the Navajo "Living In Two Worlds" as well. Continuing in that vein - the organization United with Israel has created a Facebook page (from which our Aleph is taken), United with Hebrew. 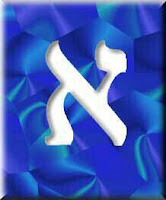 United with Israel says, "Whether you're a beginner or a pro, if you LOVE Hebrew, this Page is for you." Abq Jew agrees: this is a low-stress, pleasant way to learn Hebrew! And continuing about the Dialogue - the Dialogue should be continued (and expanded)! This first meeting was long on areas of agreement - entirely appropriate for a first meeting. But, as Rabbi Rosenfeld has pointed out, examining our differences may be more fun - and more productive. On to the next Dialogue!